On Thursday 17th November, Lord Newby, former spokesman for Her Majesty’s Treasury in the Lords, will be in Newbury to find out how our local businessmen and women think Brexit is going to affect their trade. He will also give us an update re what’s going on behind the scenes in parliament. This visit is part of the National Brexit Consultation being run by Liberal Democrats across Britain. I want to be sure the concerns of businesses in Newbury and West Berkshire are included in this mix. Of course, Liberal Democrats continue to believe that Britain is better off in Europe, but our immediate priority is to make sure British business does not pay the price of a rushed withdrawal. Whichever you voted in the Referendum, you will be welcome. I am keen to make sure all views in our area are represented. The results of the National Consultation will be drawn to the attention of Theresa May and her colleagues as part of our challenge to government, as they negotiate the UK’s withdrawal from the EU. Whether you run a care home, a pub or a café, whether you are a baker, a racehorse trainer, a tech expert or a publisher – I want to know what worries you about Brexit, or what pleases you. Or perhaps you are torn, with business results working against your principals – and I have met one or two people like that, where they sell goods abroad and are doing quite well out of the falling pound, even though they, personally, fervently wish the UK could stay in the EU. Responses to the online surveys are flooding in. The balance of opinion shifts every day, but so far 65% of people who have responded say they expect Brexit to have a negative effect on their business. 35% of businesses report that the falling value of sterling will have a positive effect on their trade. The Event takes place on Thursday 17th November, 18:30 at Shaw House, Newbury, RG14 2DR, RSVP. Anyone wishing to reserve a seat should write to Judith Bunting at judith.bunting@wbld.org.uk or by post at NWB Liberal Democrats, Commercial House, 53B Kingsbridge Road, Newbury, RG14 6DY. Or just turn up on the night – we are not gong to turn you away. Many congratulations to Elizabeth O’Keeffe and the team on her win in central Newbury. Thanks to everyone in Victoria Ward who voted to supported Elizabeth and the Liberal Democrats. While in government the Lib Dem team has put through some of the most common sense, socially democratic policies this country has seen for a generation. If I am elected to Westminster, whether we are in Coalition with Labour or Tories or no one, I will work with our team to do more of the same. A World Class Education: Education is the top priority for Liberal Democrats. In government, we will guarantee education funding from nursery to 19 and qualified teachers in every class. The only way we will achieve greater equality in the country is to make sure everyone has the chance to make the most of what they were born with, whether you’re a high achiever or work with special educational needs. Prosperity: We want to balance the budget fairly. To do this we will cut some, but no where near as much as the Tories, who are planning £12bn out of welfare (compared to our £3.5bn of cuts). We will raise the additional funds by extending Council Tax bands – let’s have the same rule for all. Once we’ve caught up with the deficit, we look forward to investing to build a high-skill, low-carbon economy. Quality health care: We have a clear plan to allow us to invest £8 billion in the NHS by 2020. We are already investing large sums and have a plan for £3.5bn for mental health treatments in the next year. We will continue our campaign to guarantee equal care for mental health. Fair taxes: Raising the Personal Allowance from £6,800 to £10,600 has been a huge change that only happened because Lib Dems were in the coalition. Isn’t it great that all the other parties have taken the policy on board? A fundamental change to British society that’s benefitting 45,600 people in West Berkshire. In the next parliament we would continue the plan £12,500, cutting your taxes by an additional £400. Science: A Liberal Democrat government would introduce a package of measures supporting innovation in UK businesses. The manifesto also includes ringfencing of the science research budget and introducing a green innovation arm to the British Business Bank. Environment protected: We will continue protecting nature and fight climate change with five green laws. In the past 5 years we fought day by day to protect the green agenda. We have doubled investment in renewable energy and almost tripled renewable energy generation. 15% of all UK power now comes from renewables. Climate change is critical and we will continue this focus, with the target of having 60% UK energy coming from renewables by 2030. Housing: Locally and nationally Lib Dems will work to bring empty properties into use, speed up housebuilding and introduce new Help to Rent and Rent to Own schemes for youngsters in work without the means to afford deposits for rental or home purchase. We would pursue a plan of building Garden Cities in parts of the UK where they are welcomed. We would double council tax on second homes to discourage the buy to let market. This is a very tempting investment while bank interest rates are so low, but it’s helped accelerate the boost in house prices and in rents. Above: With Courtney from Thatcham, an apprentice at the Thatcham Automotive Academy, which trains youngsters from across the UK for the motor repair and insurance industries. The Liberal Democrats aim to see an extra 100,000 young adults into work through on the job training such as an apprenticeship or full-time education. This week, Nick Clegg outlined a plan which focuses on cutting youth unemployment cut to its lowest levels since records began. This announcement is critical for Newbury and West Berkshire. Our high achievers here do well, and we are rightly proud of what they achieve. The increasing number of NEETS in our area is worrying, however (Youngsters Not in Education, Employment or Training). If I am elected to Westminster, I am determined to see the number of unemployed youngsters in our area drop. Liberal Democrats believe in spreading opportunity to everyone, no matter what your background. The opportunity to work and have a fulfilling and rewarding career is crucial to this. In a future government, Nick will launch a Youth Unemployment Action Plan. He will also set up a new Youth Unemployment Task-force within the first 100 days of government to fast-track getting young adults back into work. In Government we created two million new jobs and two million more apprenticeships. We have reduced youth unemployment, but it’s still too high and there is much more to do. I remember hearing Vince Cable talking about the importance of apprenticeships long before we were in government. Now we want to double the number of businesses taking on apprentices, open up work experience opportunities, transform careers advice and, across the UK, invest millions into mental health services. Youth unemployment was rising long before the financial crash. It increased by a third under Labour. The Conservatives risk making things much harder for young people by stripping them of jobseeker’s allowance and housing benefit. Only the Liberal Democrats have a comprehensive plan to tackle the scourge of youth unemployment. 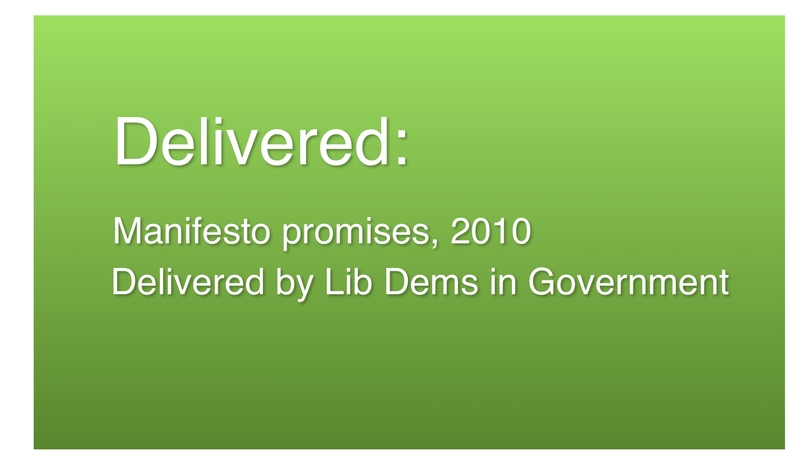 I thought I would share my personal list of policies that were included in our 2010 Manifesto and have been delivered by the Lib Dems in Government.It’s a wonderful list, including some of the most socially democratic policies this country has seen for a generation. Not bad for 57 MPs. Newbury and West Berkshire Liberal Democrat parliamentary spokesperson Judith Bunting, today welcomed the government’s upcoming changes to health and social care funding and their tightening of the rules as to how this funding must be used. Norman Lamb’s changes mean people in Newbury and West Berkshire with ‘substantial’ social needs should now get a better deal from West Berkshire Council. Judith requested an urgent meeting at the Department of Health to discuss the imminent crisis in care in West Berkshire caused by the mismanagement of local health funding by Richard Benyon’s Conservative Council. For the past ten years the Council has provided social care only for those in ‘critical’ need. Secretary of State for Health, Jeremy Hunt, also refused Richard Benyon and his Council’s plea for more money to make up the claimed ‘shortfall’ in funding. Judith Bunting responded: “This is not about party politics. I wish there wasn’t a need to campaign about education provision in West Berkshire, but local children are being let down and that is simply unacceptable. Our children deserve the best education possible, no matter what their background. This weekend Judith Bunting and the Liberal Democrat team were in Northbrook Street in Newbury to promote the Education for a Fairer Future campaign. This campaign comes against the backdrop falling GCSE results throughout West Berkshire and average achievement levels at GCSE, last year, which were below the national average. Newbury and West Berks educational attainment has been in decline for some years – last year GCSE English results fell by 10% in West Berks. At the same time, the Council has cut funding for school support officers, year on year. Each time they make these cuts, Lib Dem Councillors point out the dangers in what they are doing and make a stand. Each time, the Council Leaders do not listen. The decline of local schools in such an affluent area is a stain on the conscience of West Berkshire Council and a symptom of conservative complacency. Let’s ensure West Berks Council does more to support the futures of young, striving students in Newbury. Judith Bunting is also putting pressure on the council to increase Education provision for the 4,000 new house due to be built in Newbury. Education for a Fairer Future: change.org/petitions/increase-education-provision-in-west-berkshire. I am writing from West Berkshire, where we have a problem in our education system which I am hoping you, as Secretary of State for Education, can help explain. West Berkshire recently ranked one of the best places to live in the UK (top 20% places to live). It is the kind of place where kids receive encouragement at home. The area’s relative affluence also means Conservative led West Berks Council is not strapped for cash. Despite these positive factors, educational attainment across the district is in decline. In 2011 on average 58.2% of pupils across the UK achieved five good GCSEs. In West Berkshire this figure stands at 60.1% (figures here 2011). In 2012, the equivalent figures were 59.4% and 57.2% (figures here 2012) . As the National average for students obtaining 5 good GCSEs went up by 0.8%, results in West Berkshire went down by 2.9%. In a single year, results in Newbury and West Berkshire fell by nearly four times the national average. If that doesn’t persuade you we have a problem, let’s try another example: From 2011-2012, the percentage of the district’s pupils gaining A* to C grades in English fell by 9.86%. The Council blamed this on a national downturn in GCSE results. The national downturn, however, was only 2.71% (English figures here). Once again, a downturn of nearly four times the national average. For students’ performance to fall so dramatically across the board, the failings cannot be with individual schools. The problem must be systemic. Such decline cannot be allowed to continue. Mr Gove, as a local resident I can tell you that West Berks is not a below average place. We have fantastic teachers, parents and schools who know education is the key to empowering the next generation and to employment in the skills economy of the future – which, locally, means with industries such as Vodafone, Bayer and AWE Nuclear. I recently started a petition – Education for a Fairer Future – because I believe the educational decline in West Berkshire must be addressed. I am also meeting local head teachers to discuss what they think could be done to improve results across the District. I am writing to you to ask whether the Department of Education will help me investigate why West Berkshire is under-performing in education, before the decline in our local schools damages the futures of young, striving students in Newbury and West Berkshire. As a good Liberal Democrat, I am copying David Laws in on this enquiry. I will also be sending a copy of this letter to our local paper, the Newbury Weekly News.